The war between President Obama and Mitt Romney for the affections of Hispanic voters is most often fought on the battlefield of immigration. (That’s a metaphor; Immigration would be a ridiculous name for a battlefield.) In fact, sometimes, when we (politicians/pundits/the media) talk about the immigration debate, we act as if it’s the only issue that matters. But a new Gallup poll is a good reminder that Hispanic voters care about a lot of other things in addition to immigration laws. 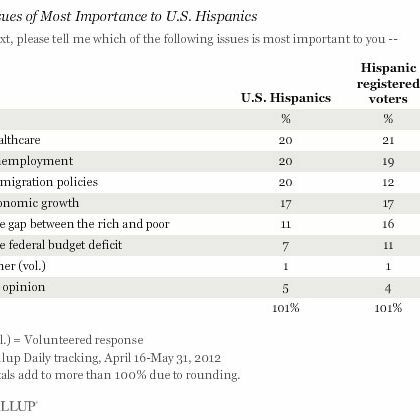 Turns out that, like everybody else, Hispanics also prefer to have jobs and earn money and maintain their health. Go figure.